Floyd Mayweather Jr. does everything in the most luxurious way possible. After all, there's a reason his nickname is "Money." 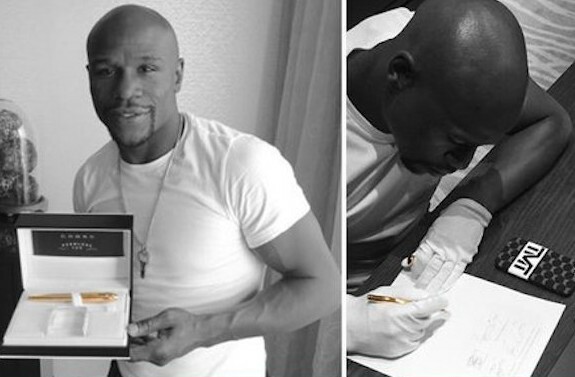 Money used an 18 karat gold pen worth $4,000 to sign his contract for the big Manny Pacquiao fight. The pen was crafted by Cross and is aptly named the Peerless 125, as that is the total number of the golden writing instruments issued around the globe. A spokesperson for Cross commented on the occasion. He stated that it was an honor to add Floyd to the list of "noble" clientage who have frequented the brand for important matters; One that includes President Barack Obama and television/media magnate Opray winfrey who has actually signed official documents with a Cross. 'Money' retired the pen after he signed contract saying it's now "a part of history." Leave it to “Money” to drop four grand on a pen, then never use it again. If that is not the definition of opulence, we do not know what else to say.